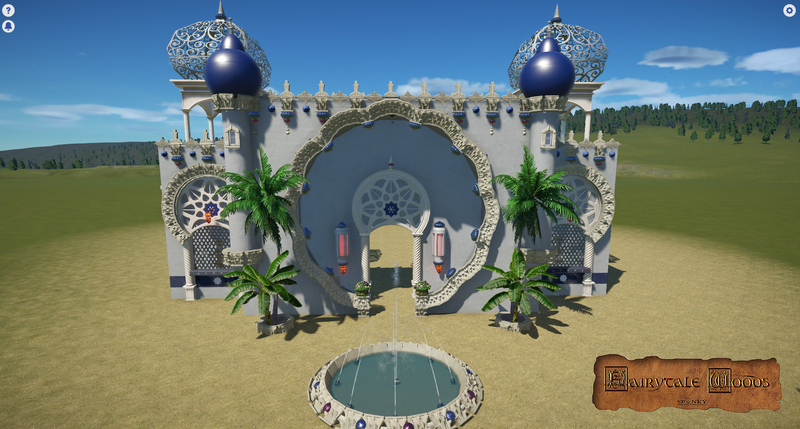 After a very ... really very long time I once again decided to build a new park. And no ... this time it is not (yet) a green ogre . and is a park themed around several fairytales from all over the world. A kind of Spanky's World, but themed with more imagination. I build at this park whenever I feel like it. There may be intermittent breaks. 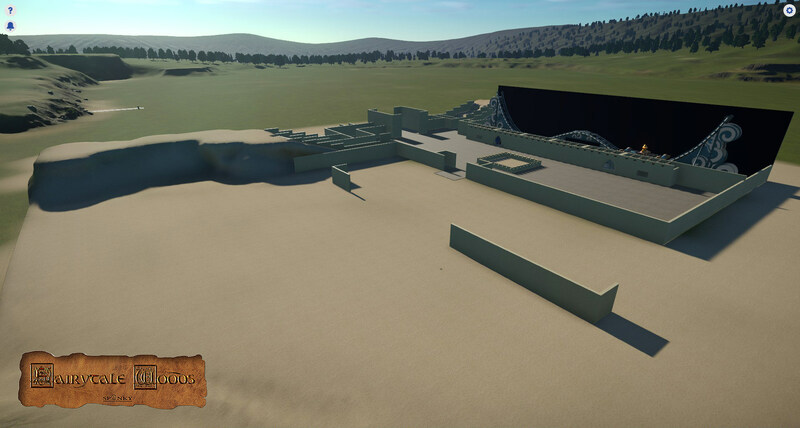 I had also already a storyline for the new park thought out and written down, but alone the introduction would have already two forum pages (without pictures). In addition, the story would feel obliged to build the park after the story and not by what comes straight into my mind. 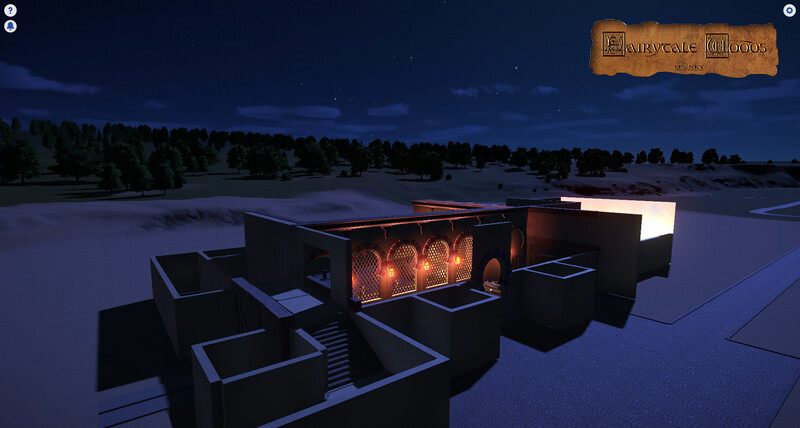 Some of the buildings that will be shown in the pictures, I might also reject and re-build or completely omit. 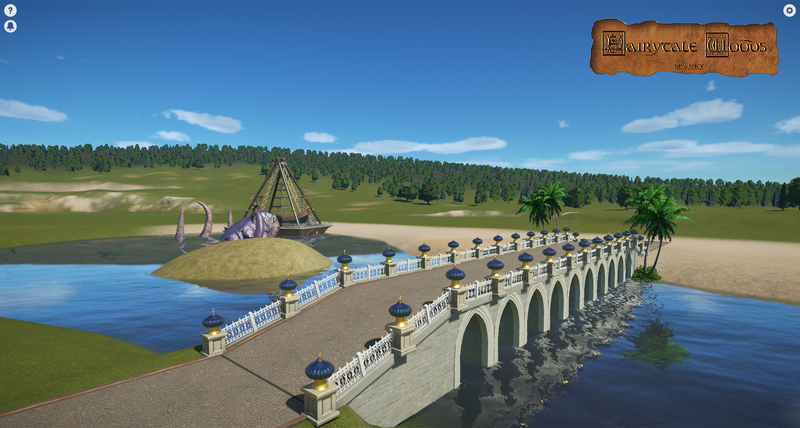 That is why I consider this thread more than a kind of scrapbook, in which I keep, develop or reject ideas for my park. 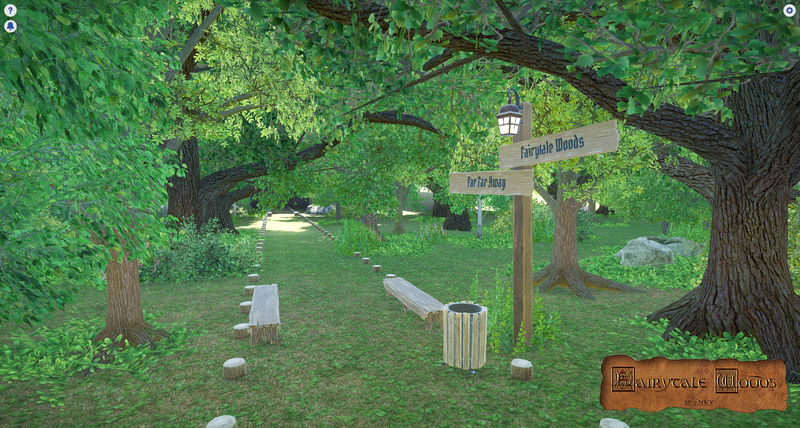 As the name of the park already reveals, the park is located in a large forest area. A few signs point the way to the park and ... well, I can not leave it. 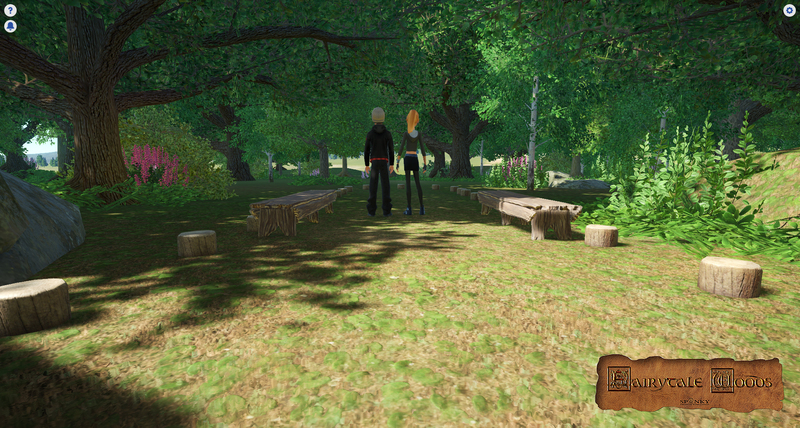 Bo and Ed, our lovely Community managers from Frontier, have already heard of the new park project and have visited the forest. 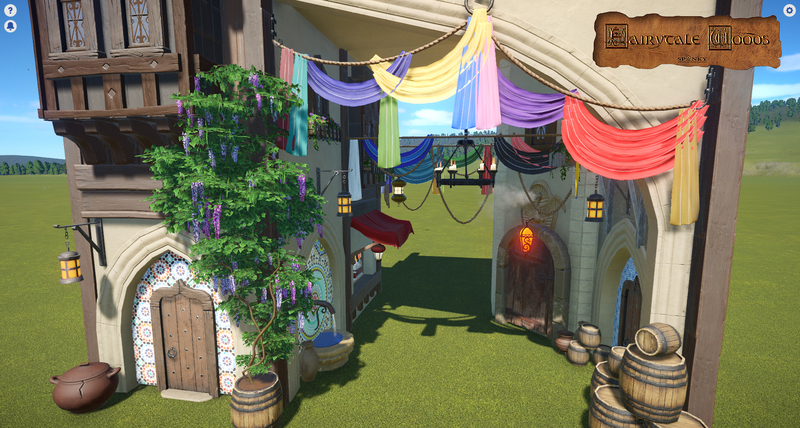 Since I still have no significant ideas for the entrance area (a fairy tale book would be great, but there are a lot already), I started with the first themed area ... 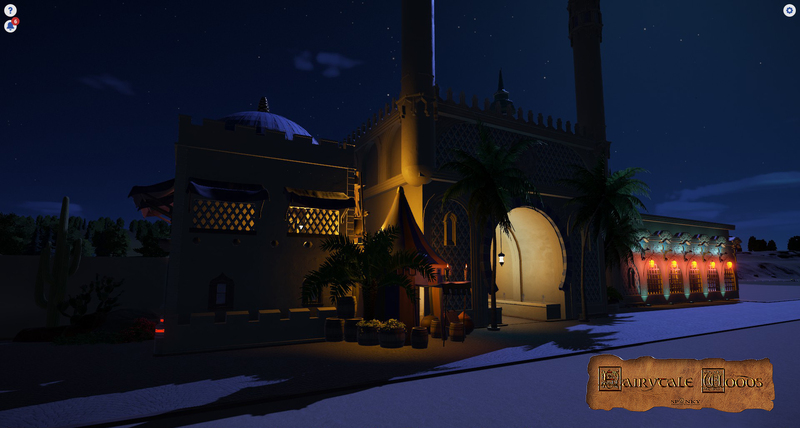 The Tales of the Arabian Nights . 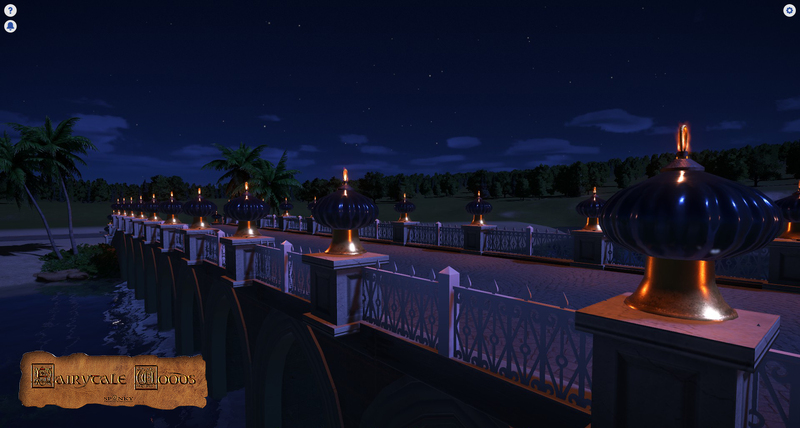 The bridge looks very nice at night. 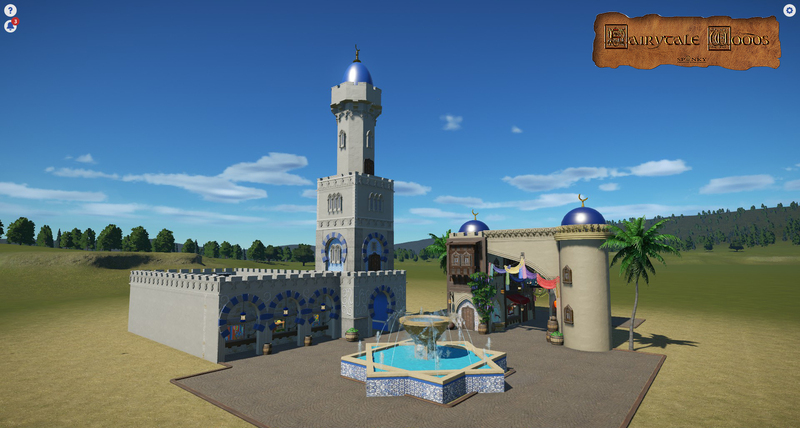 Bazaar and larger building with tower (inspired by Efteling's "Fata Morgana"). 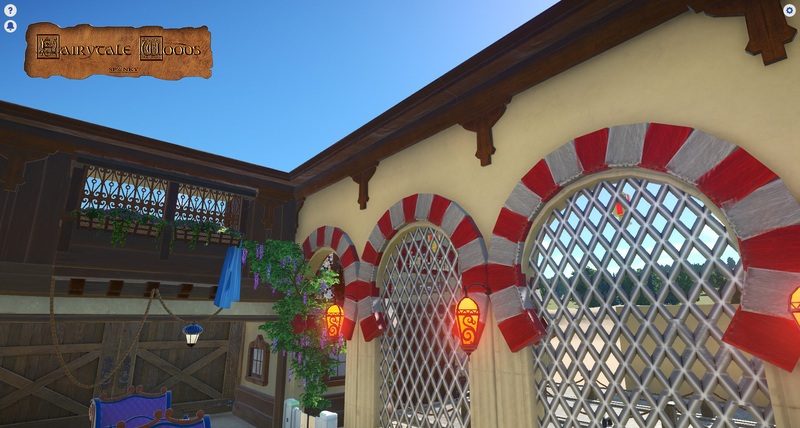 The larger building holds many shops and a toilte and should be a entrance to a train station or a dark ride. Another perspective on the two buildings with a new fountain in the middle of the plaza. 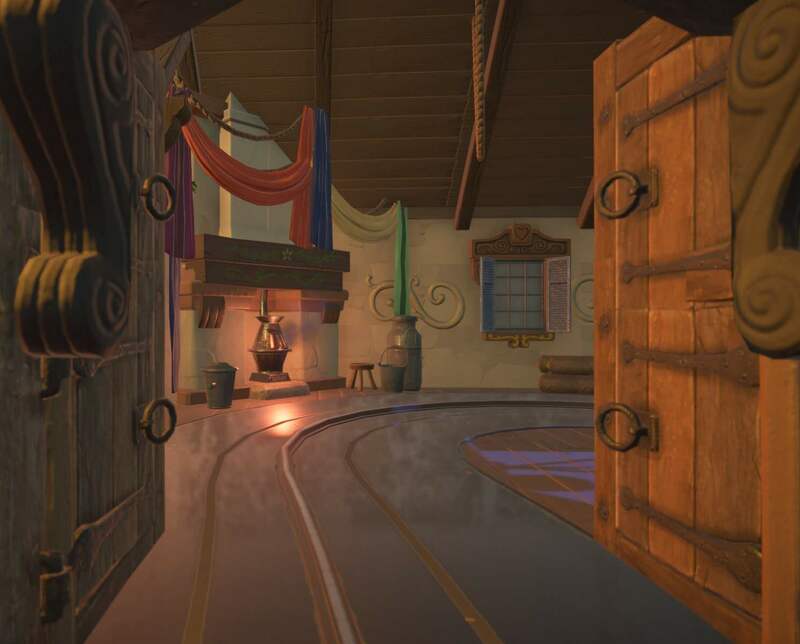 All this buildings and the fountain are saved as blueprints and on this pictures not on their final position. 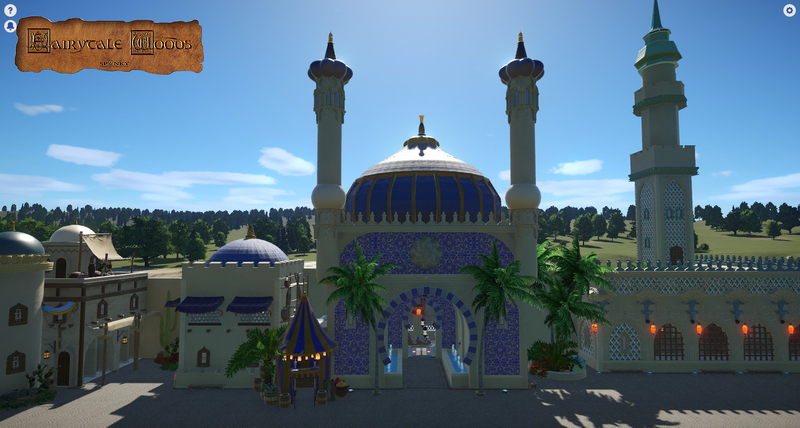 I hope you'll like this park-project. Comments and critics are welcome. Spanky, that is gorgeous!! I love the mood of the forest and the architecture is looking amazing. WOW. This is going to be good. Starts out so simple with the forest...then BAM! 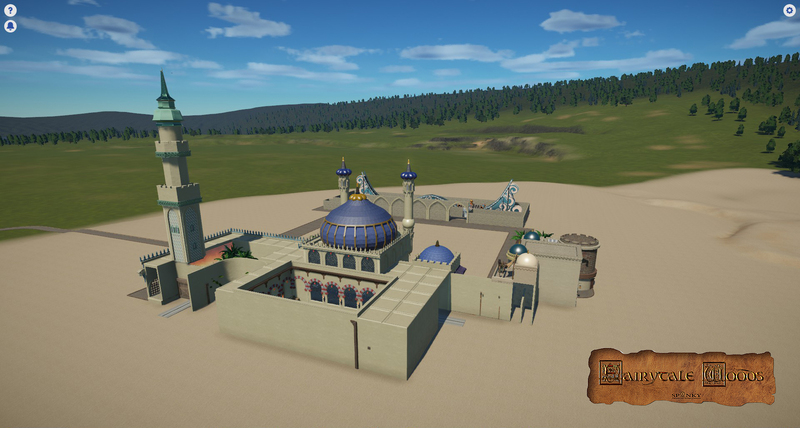 there's those fantastic Arabian buildings! I've been in love with your work from the beginning! 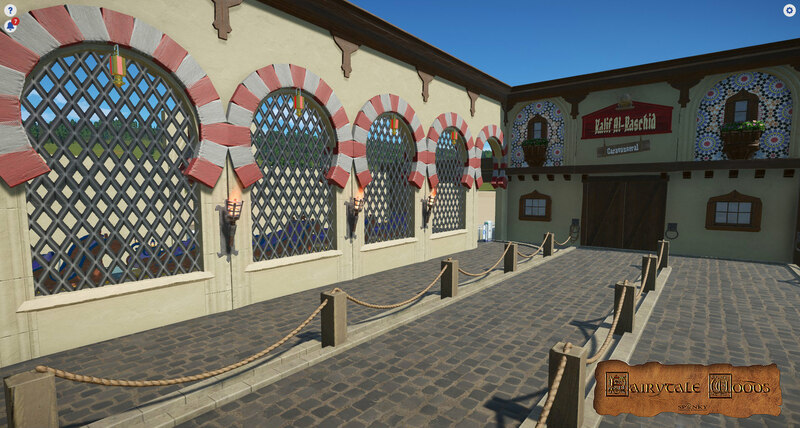 I'm so impressed with how you've been able to migrate your RCT3 building style to planet coaster. Awesome job! That entrance is magnificent! I love it. OOooh, there's so many things I like about this that I don't know which one to point out! So instead I'll just settle for saying: More please! Thank you very much for all your nice comments. For me it is absolute okay if your want borrow some of my ideas. Sounds better than steal. And I think I have also borrowed one or two ideas for my buildings. I'm currently in a somewhat stupid situation. You have me really motivated, but I think I'm shot at one of my recent building a little over the top. The dome of this building loosely crosses the BluePrint border. Over 4100 parts, the two pins on the top not included. 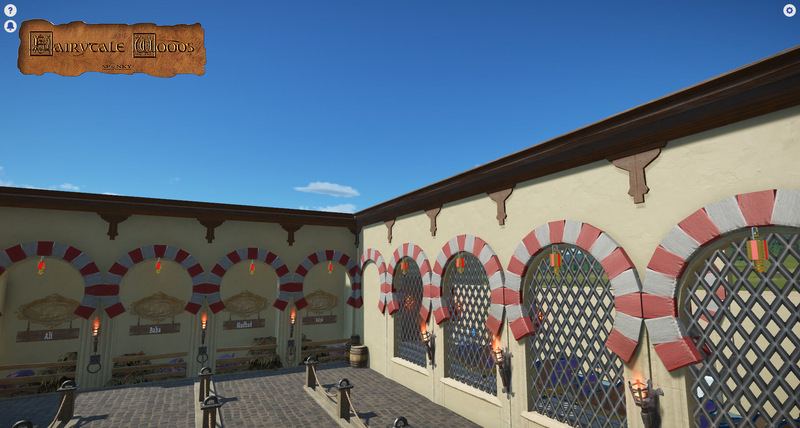 But I have found out that the Minarett roofs (and also the other related roofing) are now colorable. 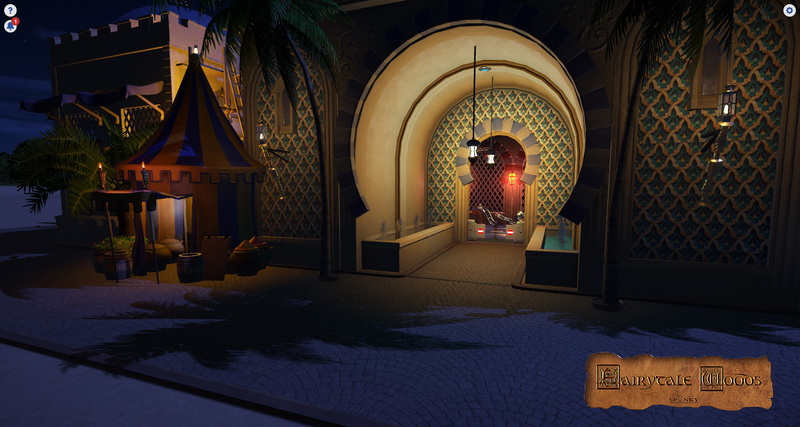 I'm not sure, if I will use this building later in the final park environement too. 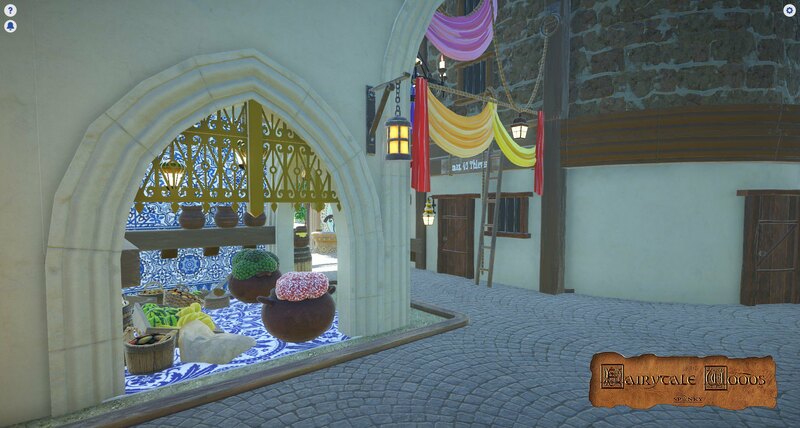 Next is a picture of a litte Spice Shop on the backside of the bazaar. On the right side there is a small jail building, which can only handle a capacity of max. 40 thieves. 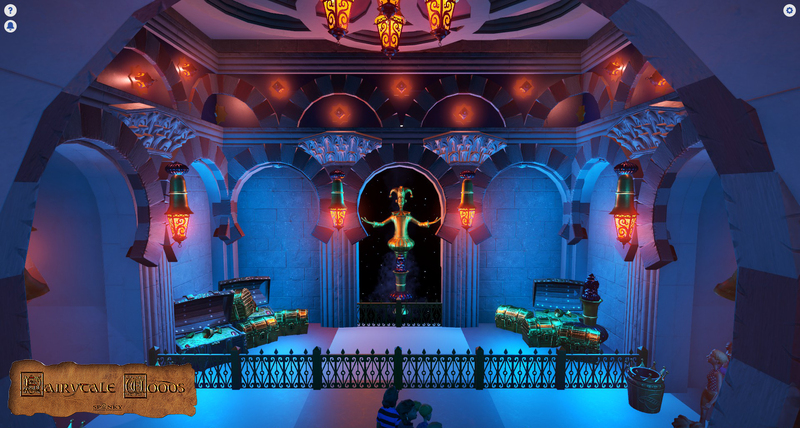 I have also tested to create a lamp shop, once again I wish we could change the colors of the light in different lamps too. 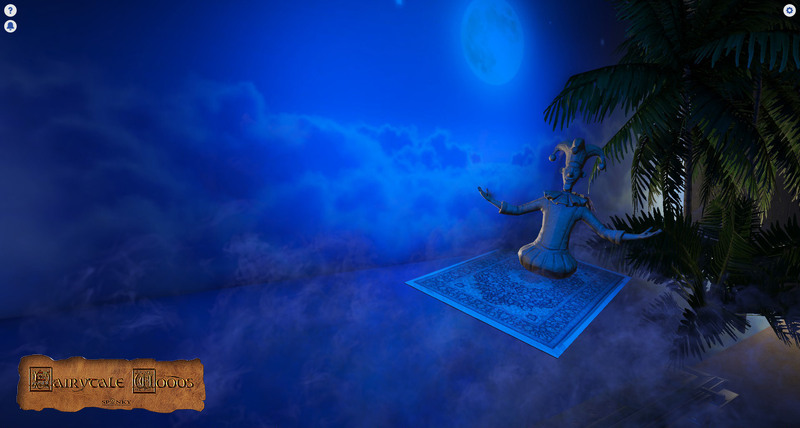 Maybe Aladin's Wonderlamp could help to make this wish comes true one day. 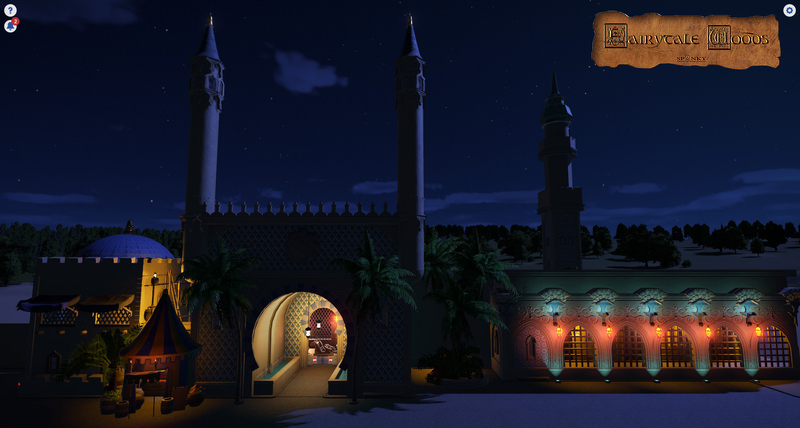 The last building for today is modelled after a real mosque, it's not finished yet but will defintively be a corner part of the "1001 Nights" Dark ride. I think, I will change the patterns on the billboards to a more matching color. Thanks for reading. If you took some of my ideas feel free to post your creations in this thread too. 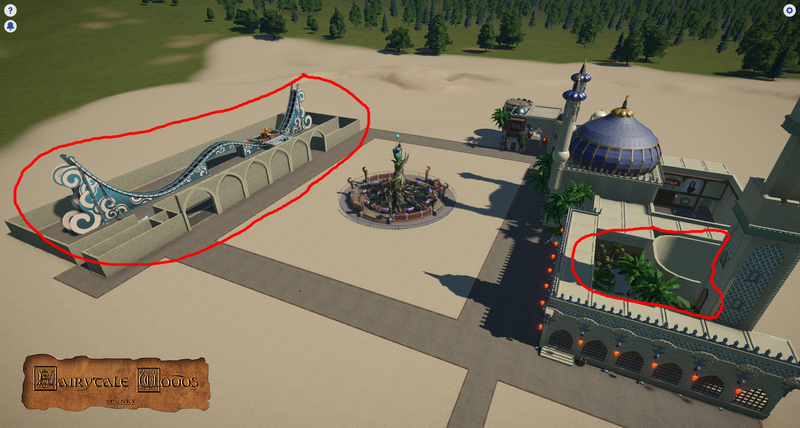 I think, it's funny to compare how different one and the same idea could look in different parks. So charming. Definitely reminds me of the Efteling the way that the environment itself is an attraction. 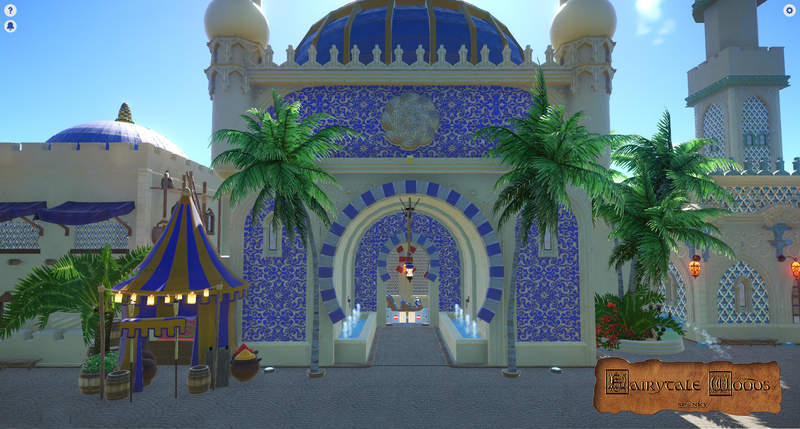 The bazaar looks like a wonderful place to explore. 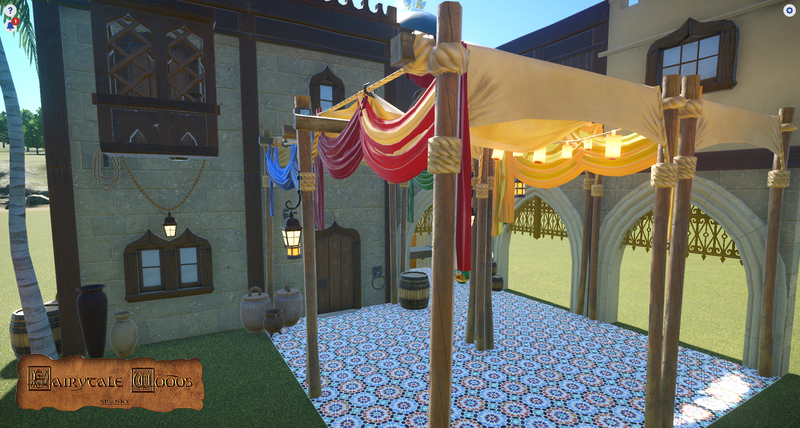 I borrowed the bunting-as-curtains to make the 7 Dwarf's clothing, strung out to dry over the fireplace. 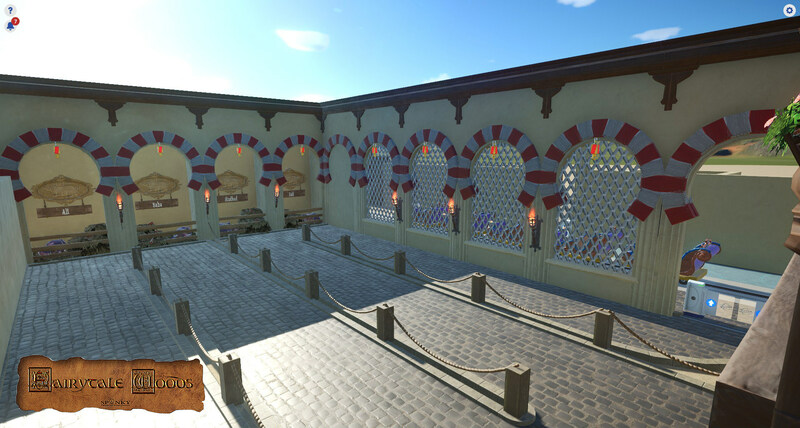 I love the Bazaar and so far the mosque looks really nice! that custom texture is a great choice! 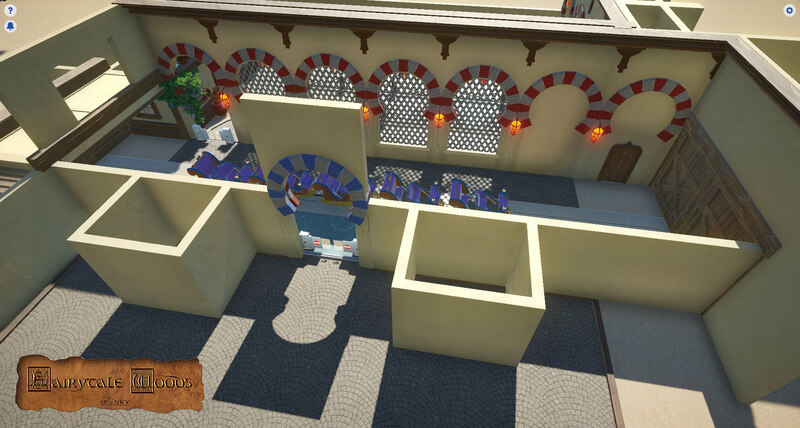 I'm more a building modeler as a park modeler and that makes me currently a litte crazy. 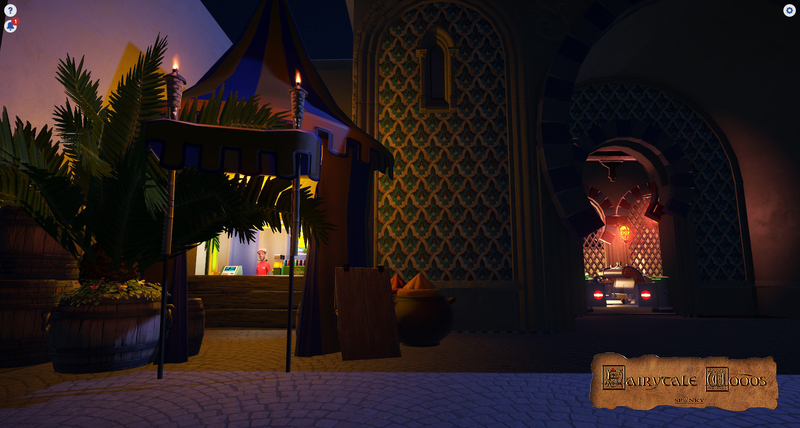 I don't know how many times I've started last week with the building of my first dark ride. 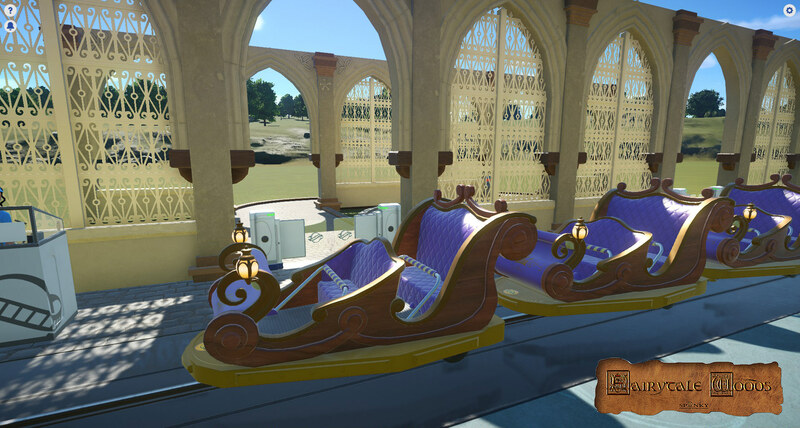 First I've placed the ride in a location, which was to close to other planned areas. Then I've moved the buildings several times from that place to this place. 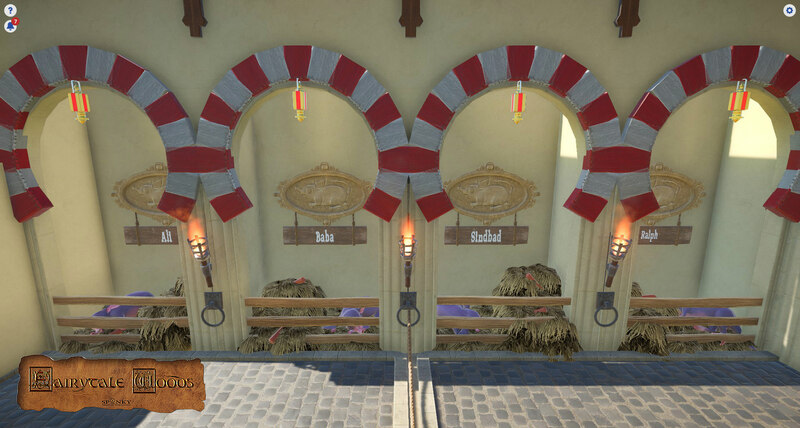 The most stupid idea was the try to build the whole area in once big building with all rides included. I realized very late, that this idea won't work perfect. 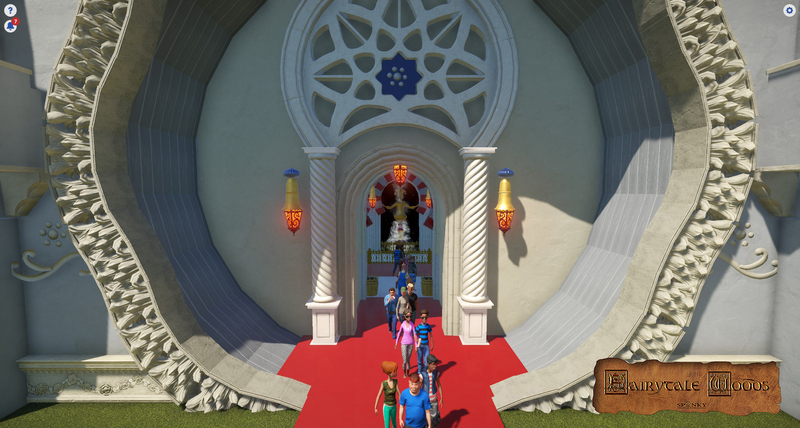 A picture of the All-In-One Building with the Genie Ride. 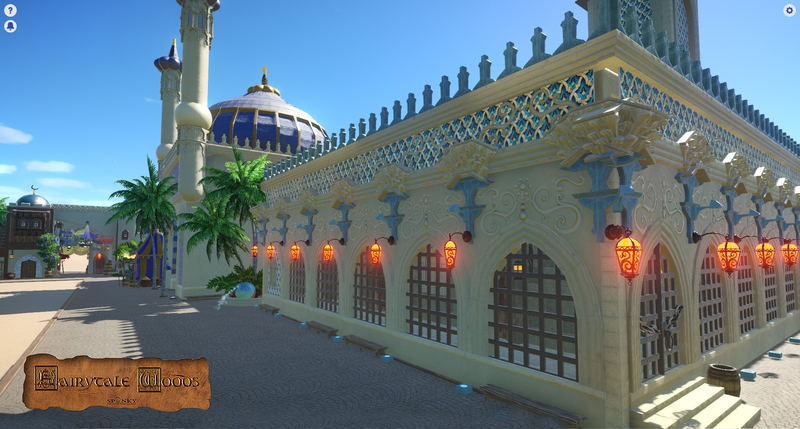 Of course, belongs to a section on the topic "Arabian Nights"
I think, most of us have the intension to make their buildings looks perfect. I have always more than three versions of a building, before I was satisfied with the result. 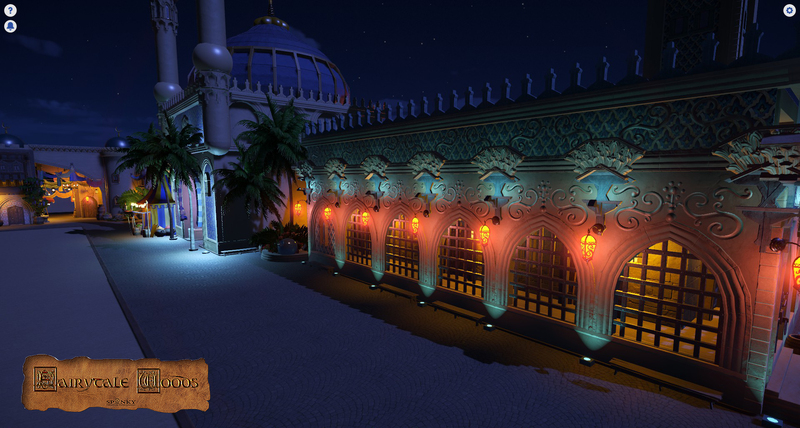 Here is a very first version of the station for the "Arabian Nights" dark ride. The only thing, that survives from this version are the sleds and the color of the seats. 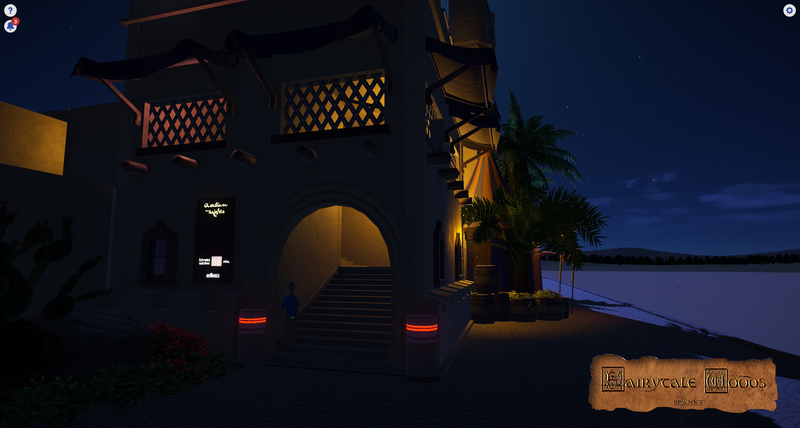 Then I came up with the idea of ​​taking over the All-In-One building at least for the Dark-Ride. The facade will reproduce several buildings. 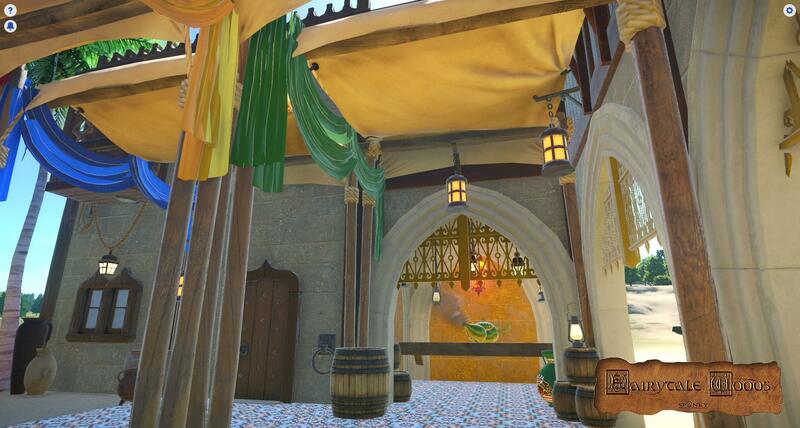 The courtyard with the queue should be look like a old caravanserai, as they were once found all over the Orient. The courtyard with the stables. 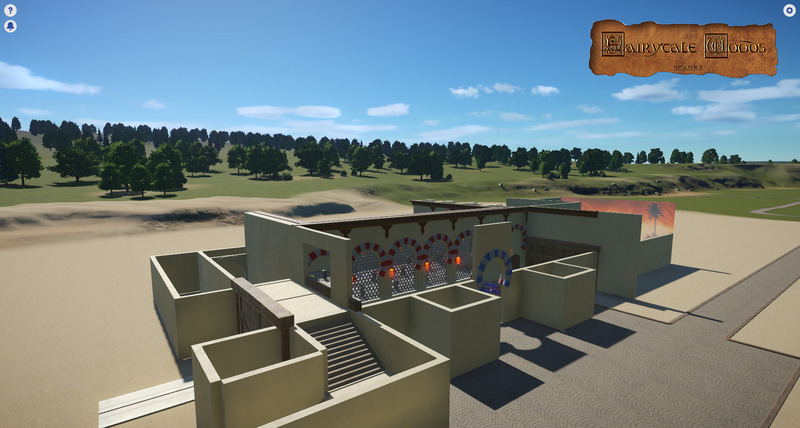 Unfortunately the park does not have enough female employees , which could be exchanged, so in the stables of the caravanserai instead of camels small drats are bred. 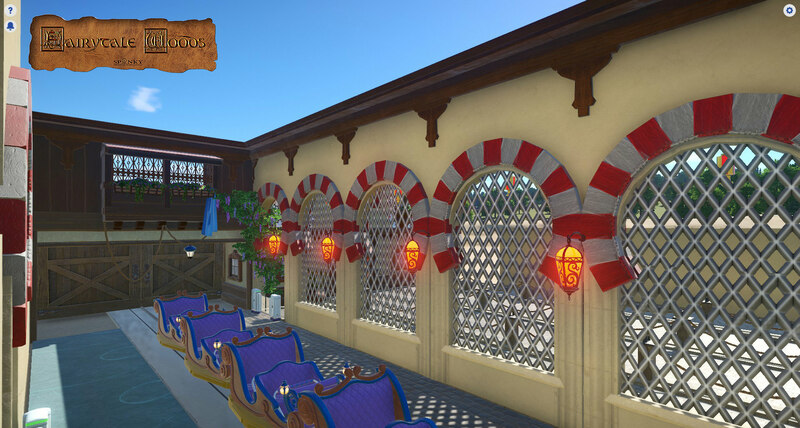 Oops, I almost forgot ... here is a little (very, very raw) tease, on what you will expect in the ride. But now, it's reall all for today. Comments and critics are always welcome. Thanks for reading. This is very nice! Loving the style. Thanks for all the likes and comments so far. It motivates me a lot. I agree with you, that the whole building looks at the moment very square. But currently it's just the base of the building with the station and the queue. And I don't know how I can make a station more curvy . 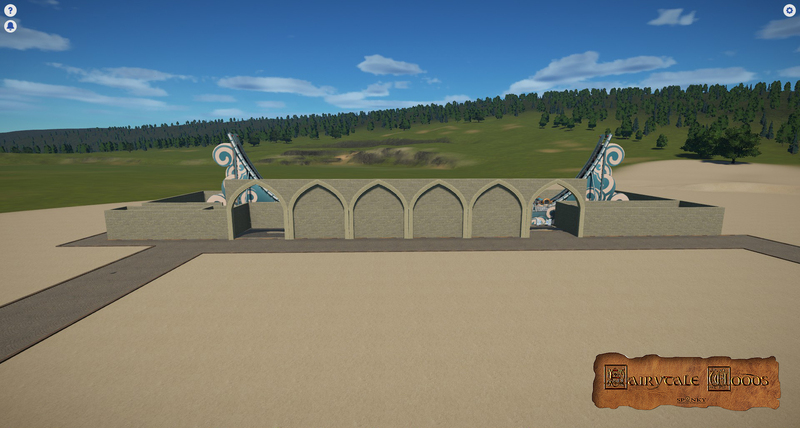 When I add later the minarett-towers, decorative bows and something more of the dark ride's interior it will maybe looks more organic. I'm really in love with that last photo! 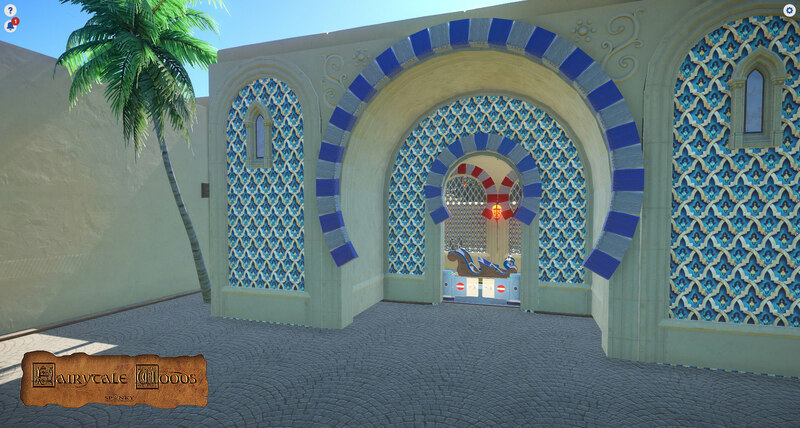 Just a few shots from the front of the "Arabian Nights" Dark Ride building ... in fact the main gate of the building is the exit of the ride. 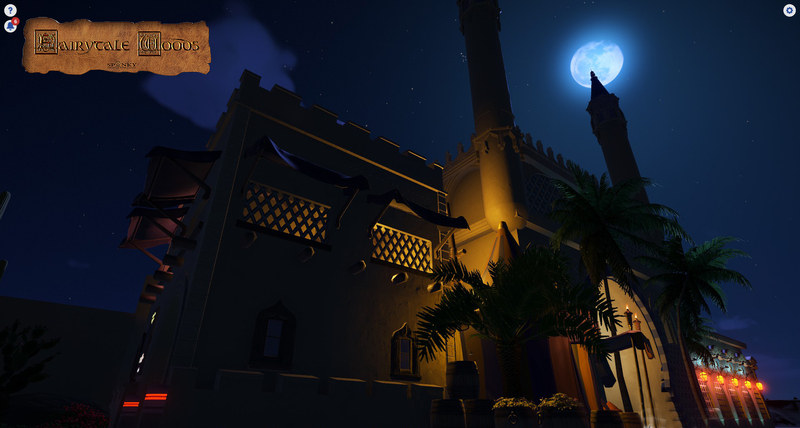 That lighting on the right of the last night photo is gorgeous. Love the combination of colors. Thank you all very much for your gorgeous comments . I am really happy that you like the color combination of the buildings and the light effects. I myself am always surprised again, which color effects are caused by the light. For me it sometimes takes longer, until I like a thing 100%. 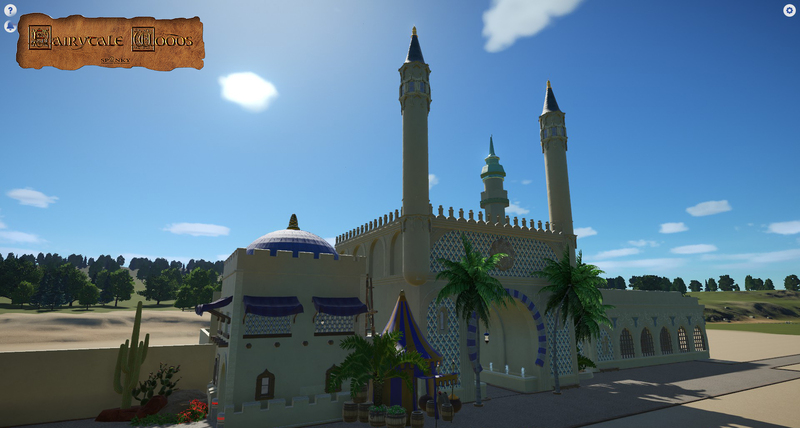 I think, I have now finished the front part of the dark ride complex. 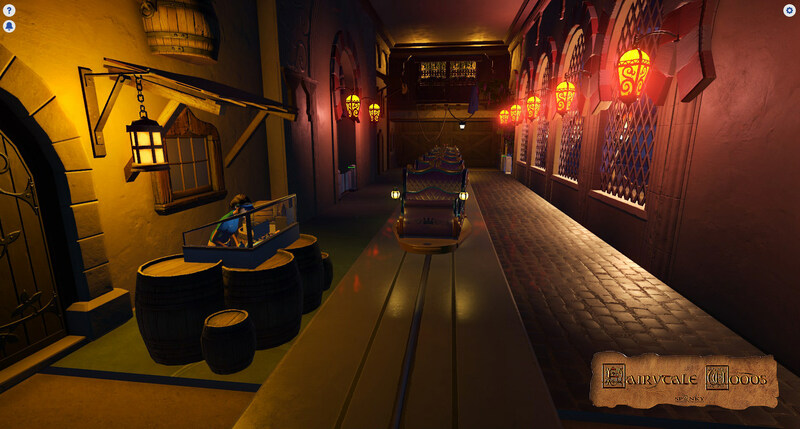 The interior and the ride itself with the planned effects will probably give me some headaches. 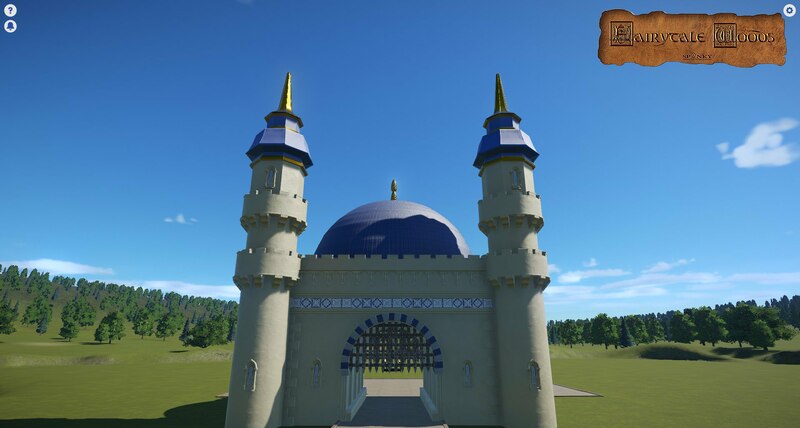 I'm a little proud of the dome. Thanks to misterthom. I've borrored the concept of the dome from one of his blueprints, but make my own dome, because of the size and form. This picture was taken from the new opposite building. 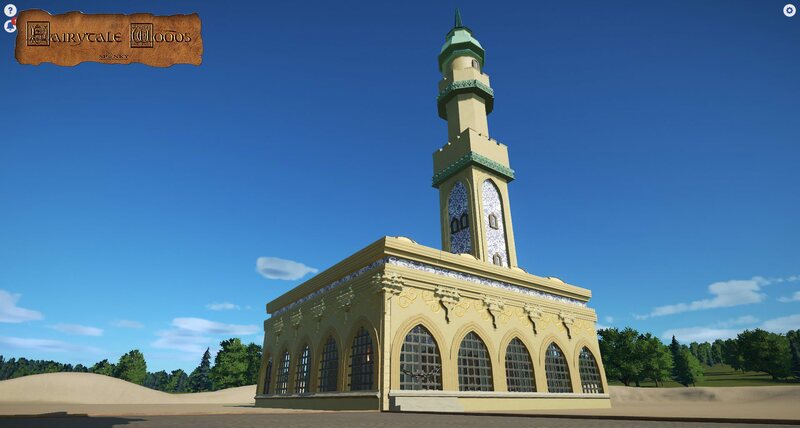 I have also changed again the patterns on the front of the "mosque"-styled building, which match now better wih all other parts. 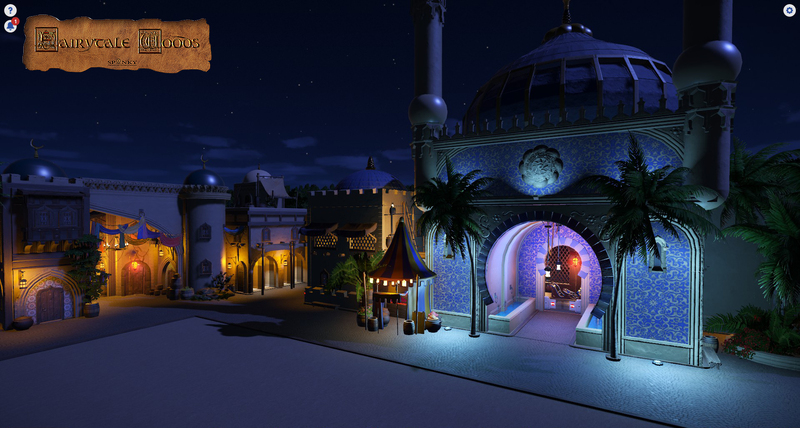 I'm not sure, if the whole area will look to static, when I add the Genie ride in oppsite to the Dark Ride Building. 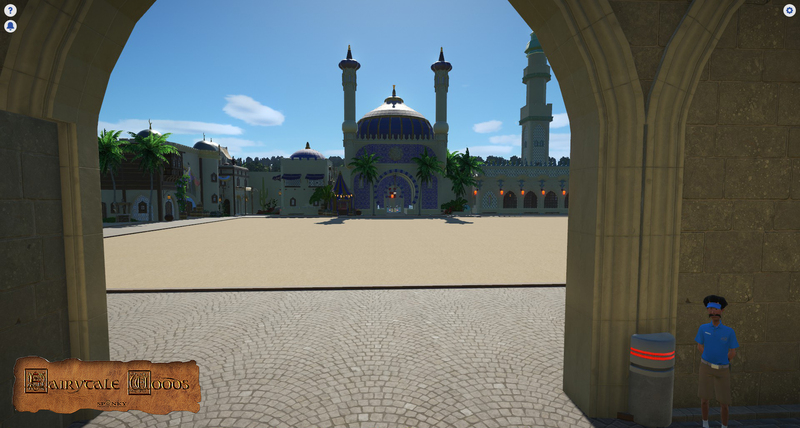 I think, that the ride in the middle of the plaza will be removed again and replaced by a kind of market with a Cafe and different shops. The red lined areas are my current problem zones (apart from the ones on my own body) and I could really need some hints, ideas, suggestions or whatever. 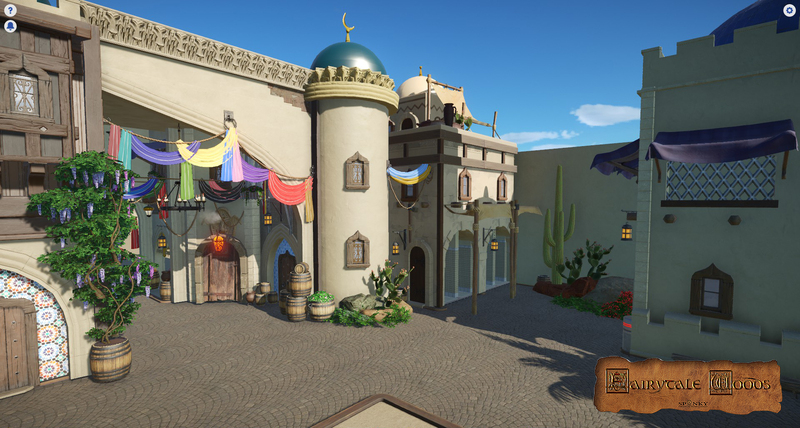 At last for today, the current, but definitely not final front of the Genie Ride building. Hope you'll like it and please comment my pictures. 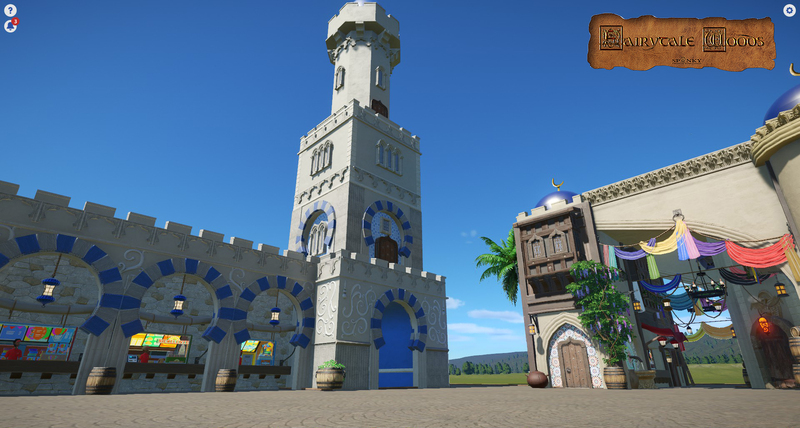 I love the blue colors you used, has a really nice Arabian feel to it. I also like how the sleds suddenly fit another theme than Christmas. You have really transported me to another world. This is great - everything looks so authentic! This keeps getting better. I like all of the little details - like the tent, baskets, etc. They make the place feel very alive. Very beautiful! 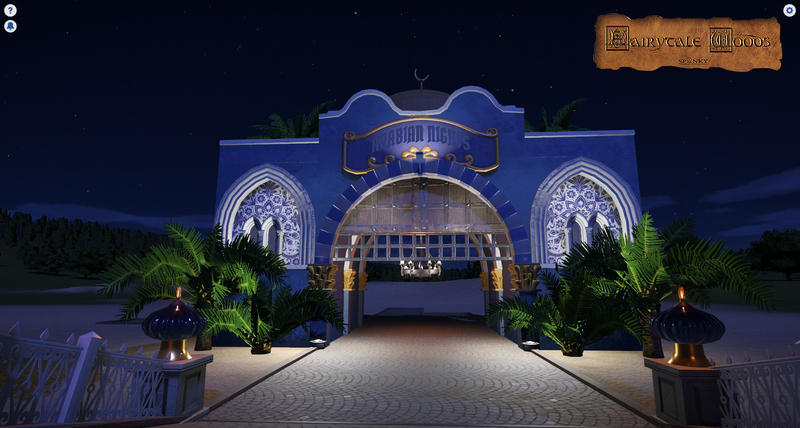 Love the Moroccan architecture. Thanks for reviving this thread. Unfortunately, I still have not got on with it. Let's see what the next DLC brings. Maybe then I will have more ideas again. BTW: Like you Outdoor Lightning Set very much. Great Ideas. I love this! 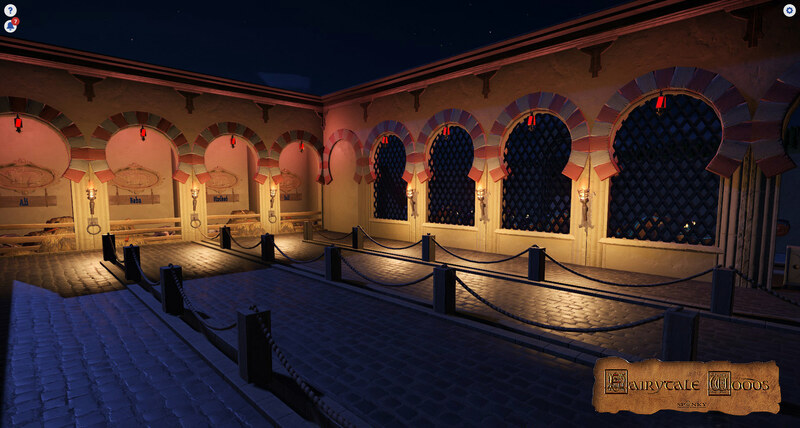 This area reminds me of the Arabian Coast at Tokyo Disney Sea, which I am sure that was an inspiration for this. Amazing job! I really hope the creators block leaves and you jump back into this! Page created in 0.207 seconds with 28 queries.